Aaaaahhhh but life is telling us otherwise. This season is all about nurturing and improving and planning. Nurturing my marriage, nurturing my son, improving the household, improving myself... and planning for baby no. 2! My life is so full and busy these days, I really do not have the time or energy to add anything in my plate. When Mon and I decided to get pregnant a few months after we got married, we both were not equipped with the necessary information to start a family. I mean, sure, we have the basics down pat but we didn't really know the nitty gritty of having a baby. It was all so new to us. Newer than having to live together when we became husband and wife. We were shopping for baby clothing and I told Mon, "we still need at least three frogsuits." He looked at me blankly and said, "Is that really what it's called or are you just making the name up?". Fast forward to 1 year and 9 months later, having been there and done that albeit only once, I can say we are now both wiser about this whole baby thing. Wiser ha, not saying we are in any way experts. Kasi look naman how clueless we were before we had Lex. Kung wala ba naman kaming natutunan within that span of time ay kawawa naman ang anak namin! My true retail partner in my baby journey since Day 1 is Baby Company. As I've written in a past post, I'm a very satisfied customer of this store. I bought almost all of Lex's newborn basics there! Crib, linens, stroller, bottles, toiletries, you name it - they have it! 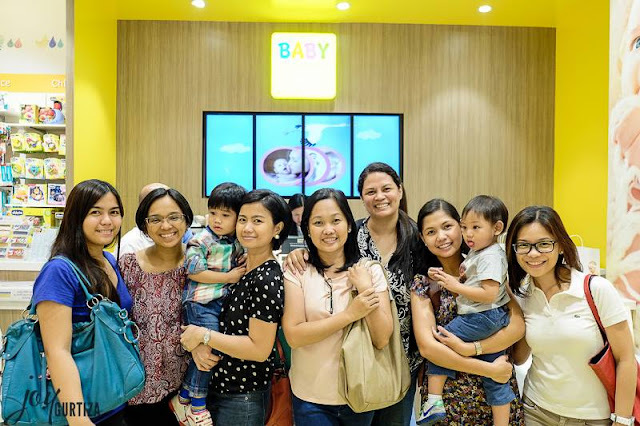 Last Friday, I was fortunate to be invited to the blessing of Baby Company's newly renovated stand-alone store located right across Cibo on the 3rd floor of Powerplant Mall. Perfect timing too because I needed to get a few things for Lex. Isn't it pretty? The first thing you'll notice when you see Baby Company's new store is the lights. It's so bright and enticing! Tapos when you go in, you'll see that the merchandise is displayed in an orderly manner, with brand signages and all. It is so customer-friendly -- you can easily find whatever it is that you are looking for in a snap. So help me plan for Baby C's nursery! Hahaha! Yeah yeah, we already have a name for our future baby girl. And now I'm planning her nursery... Si baby girl na lang talaga ang kulang! So indulge me, ok? A mom can dream. Baby Company has an assortment of cribs. There are wooden cribs, bassinets, and pack & plays. Since Lex already uses a pack & play, I wanna try out a wooden crib for Baby C. There are two cribs that struck my fancy and they're both by Cuddlebug. The mattress for both cribs are of the same size - 28x52, although the Solana crib is bulkier. I'm guessing that it's because the crib is 3-in-1, meaning it can be a crib, a toddler bed, and a daybed! O diba? Innovations nowadays are super! Imagine, pati crib may 3-in-1 na. I can't even begin to tell you how smitten I was with this bassinet. Parang yung mga old school na cradle lang. Reminds me of a Moses basket but this one looks sturdier. This bassinet is by Graco. So next is linens. There are so many quality linens to choose from in Baby Company. From fun and bold prints to dainty and subtle ones. They also have pillows and bolsters and bumpers. These pillows by Bloom are soooooooooooo nice! I'm choosing between the latex baby pillow and the child head support pillow. Or maybe I can get them both? The latex one (right picture, top row) for when Baby C is still a newborn then the head support pillow (left picture, bottom row) when she gets a little bigger. Ang gastos? Not if you see it this way. You see, babies, especially newborns, spend most of their days and nights sleeping. I am a staunch believer that enough sleep is one of the most important things that -- not just babies but even adults should get. It replenishes our bodies with energy and it helps with our brain development. And since we spend a lot of time sleeping, we might as well make ourselves comfortable while we're at it diba? Anyway, there are a couple more things that I would like to purchase for Baby C -- you know, once God gives her to us. These are things I wasn't able to experience with Lex. Swaddles! I used to swaddle Lex with a receiving blanket which he perennially gets out of! Blame it to inexperience, hindi ko lang talaga alam kung pano magswaddle ng baby. Haha. Swaddlepod by Summer is the simple swaddle solution. To my non-mommy readers, some background info. Swaddling helps babies sleep soundly. Babies kasi are used to "living" in a cramped place (i.e. the womb). When they get out of the womb, hindi sila sanay na nakakagalaw freely yung arms and legs nila. Swaddling the baby helps them get the feeling of being "like inside the womb" -- a place they are comfortable with. The other thing that I really really want Baby C to experience is a baby bouncer. This one is appropriate for babies 4 months up. A great way to stimulate their minds and a good "distraction" so mommy can have a few minutes to herself. The baby seat swivels full circle so baby can play with all the toys! So what do you think? Avalon? Solana? Or that cutie bassinet? Should I go for fun and bold linens? Or those with dainty and subtle prints? Shopping for the baby is truly one of the sweetest, funnest, makes you feel like oh-my-gosh-i'm-gonna-be-a-mom-now-!!!. But for someone who is years ahead of herself, I just allow myself to dream big dreams for Baby C.
Back to reality! Since what is important is NOW and who I have now is my darling baby Lex, of course I scoured the store for stuff I want to buy him. And because Baby Company is not just for babies but for toddlers too, I found three things that are useful in the stage that he is currently in. 1. Hugger's Backpack for Kids - as Lex slowly transitions from being a baby to a toddler, siyempre hindi naman pwede na forever na lang nasa baby bag ang lahat ng gamit niya. Sometimes he also needs a bag for things that he frequently use like a small bottle of water or an extra shirt. I have taken an extra liking to this bag because of its features: a chest strap and a safety rein. It comes in cute designs too! 2. Fisher Price Sandals - Lex is such an active boy. Always running and jumping and climbing -- you know, boy stuff! I usually just buy cheap "pambahay" sandals from SM but these ones look really good and matibay. 3. A Baby Urinal - It's actually my first time to see a product like this and I can't resist not to take a picture. Isn't it cute? I'm sure this would be useful when we potty train him. Before I end this post, I would like to share a picture my fellow mommy blogger, Joy Gurtiza shared on Facebook -- the mommy bloggers of Mommy Bloggers Philippines! Also, I want to thank Baby Company and Mommy Bloggers Philippines for this incredible opportunity. And finally, let me share with you the highlight of my day. My very own #convoswitholivia. Olivia: Hi, Tita Jen! Isn't my necklace lovely? Jen: Yes it is lovely, Olivia! But do you know what's lovelier? Mare, ninang ako kay Baby C ha. Nag presinta na talaga ako. Hehe.